Gynecomastia has a variety of causes including genetics, hormonal disorders, or can develop as a side effect of certain medications. For most men with gynecomastia, liposuction is used to remove excess fat and breast tissue. At The Manor, we often use ultrasonic liposuction to treat gynecomastia. Male breast reduction involves making one or two small incisions on each side of the male breast. The gynecomastia surgery takes about one hour to perform. It can be done as an outpatient procedure and there is minimal discomfort involved. A post-operative compression garment will need to be worn for approximately four weeks after the surgery. Normal activity may be resumed within a few days, but strenuous activity, including upper body lifting, pushing, or pulling should be avoided for 2-3 weeks. 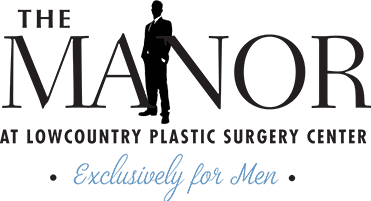 In order to determine whether you are a good candidate for male breast reduction surgery, schedule a consult at The Manor at Lowcountry Plastic Surgery Center today!